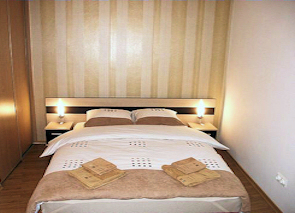 From my second experience of renting apartments in Vilnius I learned to choose accommodation carefully. To cut a long story short, on the day of our arrival the flat we chose to stay in didn’t live up to our expectations. The day was closing in but we still didn't know where we were going to stay. We were searching the Internet and calling around but because there was a festival in town a lot of accommodation in Vilnius was booked. We were almost getting desperate when we came across Natalex Apartments. We chose a studio flat just a bit outside the city centre. It was very modern, high standard and cheerful. 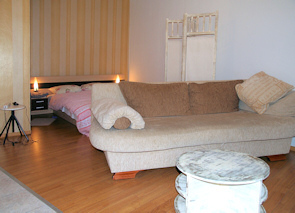 Designed with style, the flat had a pleasant atmosphere. The apartment also had free Internet access. The modern Europa shopping centre is conveniently located nearby. The windows of the apartment face the inner courtyard, which doesn't provide a great view but assures an undisturbed sleep. The flat is situated in Kalvariju 2, only 5min walk from the city centre, which you could reach by crossing Zaliasis tiltas. I loved that bridge, a small hang-over from soviet times constructions. The extraordinary statues (photo on the right) were left after independence because they are charming in their own way and being somewhat amusing make the bridge more cheerful. 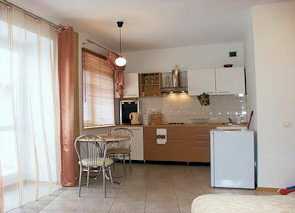 The kitchen is fully equipped and is pleasantly near the patio doors leading to the balcony. This flat is suitable for a couple or a single person who wants to be a little further away from the bustling centre, but still very close to get there when you want. at the Natalex Apartments or check out available booking dates.